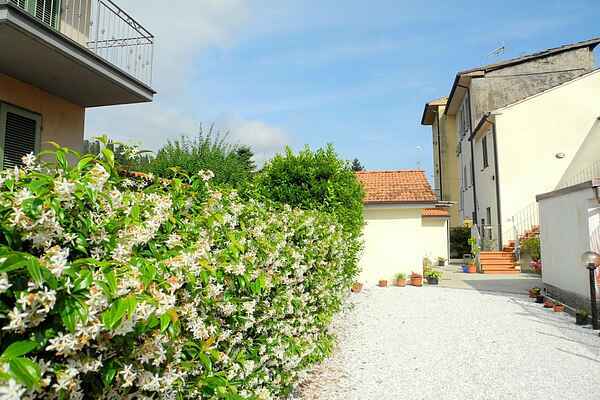 Nice holiday apartment, in a quiet area between Lucca and Camaiore. Fresh, modern décor. Garden of about 90m2 for the exclusive use of guests. Ideal for families, the beaches and the town of Camaiore Lucca are within easy reach. In the area there are grocery stores. This property offers a very strategic position for who wants a holiday to spend in the tranquility of the countryside and visit new and characteristic places. It is in fact in a point from which we can reach with a short distance the lovely town of Camaiore with its ancient villages peeping among the green hills, the majestic Pietrasanta, the cradle of art and capital of marble and the long beaches of Versilia. Find out more information on www.versilia.it. From this house you can easily reach the beautiful city of Lucca with its routes and itineraries that allow visitors to discover the historic center and its surroundings. In fact, from Lucca it is easy to trace itineraries that reflect the passions of visitors giving them the opportunity to make the most of their visit without being left alone inside the renowned walls. However, although small in size, the old town offers walks that lead the visitor to discover the various corners of the city, the narrow alleys and the particular squares for a certainly non-trivial tourist visit. On the background of the typical Tuscan landscape, the surroundings of Lucca can be visited following itineraries that combine nature, sport and beauty thanks to the cycling routes, urban trekking and horse riding. Finally, without forgetting the historical imprint still intact and evident in the city of Lucca, it is recommended a visit to the sumptuous villas of Lucca, the remains of the Via Francigena and the symbolic places of the life of Giacomo Puccini. And many other wonders to discover !! Find out more information on www.comune.lucca.itturismo. Every end of October, the town of Lucca becomes the theater of the very famous Comics and Games, international comic strip festival, animation cinema, illustration and game. An event now of global appeal that in those days transforms Lucca into an incessant procession of masks, colors, music and lots of fun. An unmissable event that deserves to be seen at least once. Area: Lucca has many paths and trails that allow visitors to discover the old town and its surroundings according to your preferences. The Riches of Lucca are many, from the artistic nature, from history to culinary tradition. It is easy to trace routes that reflect the passions of visitors by giving them the opportunity to make the most of the period of their visit without getting only renowned within the Walls. However, although small in size, the Old Town offers rides that take visitors to discover the various corners of the city, "one hundred churches," the narrow alleys and squares for a special sightseeing certainly not trivial. Against the background of the typical Tuscan landscape, the surroundings of Lucca can be visited by following routes that combine nature, sports and beauty thanks to cycling routes, urban trekking and horse riding. Finally, do not forget the historic character intact and evident in the city of Lucca, we recommend a visit to the sumptuous villas of Lucca, where the remains of the Via Francigena and the symbolic places of the life of Giacomo Puccini. There are flights from Rome and Milan linked with the airports of Pisa and Florence. It takes about three and half hours drive from Lucca - Lucca and Rome - Milan and 45 minutes from Pisa.